Carter Uncut brings New York City’s latest development news under the critical eye of resident architecture critic Carter B. Horsley. Ahead, Carter brings us his eighth installment of “Skyline Wars,” a series that examines the explosive and unprecedented supertall phenomenon that is transforming the city’s silhouette. In this post Carter looks at the “stray” supertalls rising in low slung neighborhoods. Most of the city’s recent supertall developments have occurred in traditional high-rise commercial districts such as the Financial District, the Plaza District, downtown Brooklyn and Long Island City. Some are also sprouting in new districts such as the Hudson Yards in far West Midtown. 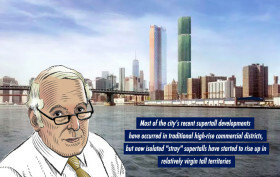 There are, however, some isolated “stray” supertalls that are rising up in relatively virgin tall territories, such as next to the Manhattan Bridge on the Lower East Side and Sutton Place.